“Results time! So I have lost 21lbs and 20 1/2” off my body. That doesn’t matter though what matters to me most is the fact I have dropped two dress sizes and I feel absolutely bloody fantastic! The photo on the left is one that was taken late July this year the one on the right is my latest sweaty selfie! I think there is quite a noticeable difference. I can’t really see my changing shape so much but I can really feel the difference. 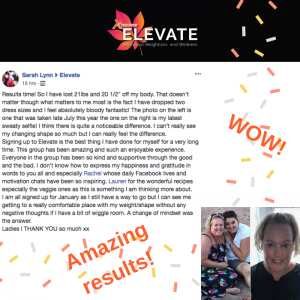 Signing up to Elevate is the best thing I have done for myself for a very long time. This group has been amazing and such an enjoyable experience. Everyone in the group has been so kind and supportive through the good and the bad. I don’t know how to express my happiness and gratitude in words to you all and especially Rachel whose daily Facebook lives and motivation chats have been so inspiring. Lauren for the wonderful recipes especially the veggie ones as this is something I am thinking more about. I am all signed up for January as I still have a way to go but I can see me getting to a really comfortable place with my weight/shape without any negative thoughts if I have a bit of wiggle room. A change of mindset was the answer. A massive well done Sarah!